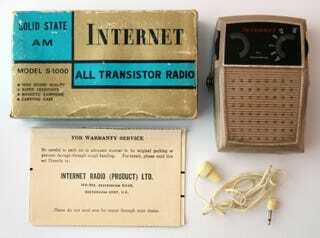 Yes, this "Internet" radio from the late 1960s or early 1970s is real. But no, it's not the doings of some sneaky time traveler. It's yet another lesson in how history plays tricks on the future. With words. This "Internet" transistor radio comes from the collection of the British antiques collector and publisher Mark Hill, who found it at a shop in Amsterdam last year. Hill was obviously surprised to see the word "Internet" on anything so old. And rightly so — the internet as we know it today wasn't even a thing yet. The strangely named antique was apparently manufactured in Hong Kong for a British company sometime around 1970, though it's not clear how long Internet Radio Ltd. stayed in business. Our modern use of the word "internet" came from the word "internetworked," but it actually dates back to the late 19th century. According to Hill, "internet" was used in the late Victorian era to describe interconnected motions. When this AM radio was released around 1970, the ARPANET (the precursor to our modern internet) was still in its infancy and "internet" wasn't on anyone's radar. In fact, as late as the early 1980s "internet" wasn't necessarily your local computer nerd's preferred name for the network. Some people liked the term Catenet, which was derived from the word "catenated." Pronounced "CAT-en-et," it's almost more fitting.